Garden Notebook – Natural Charm Entry | Faddegon's Nursery, Inc.
Jun 14, 2017 | Garden Tips, Perennials, Shrubs, Trees & Vines, What's New? Amber Jubilee™ is all about color! The foliage on this compact selection will change throughout the season and into fall. In spring, maple-like leaves of yellow, red and orange are topped with white blooms full of nectar. By late summer, the leaves have changed to dark green, red, and purple-burgundy. Ninebarks are extremely adaptable to a wide range of garden situations, but planting in full sun will give the best show! Mature Size: 5-6 ft. with a width of 4 ft. Looking for an easy shrub with deep burgundy fall foliage? Look no further! ‘Lady in Red’ explodes in spring with bright red leaves topped with pink cup-like flowers. As the season progresses, the foliage darkens creating the perfect foil to any plant with orange or yellow foliage. Also compact and adaptable. Early summer bloomer! 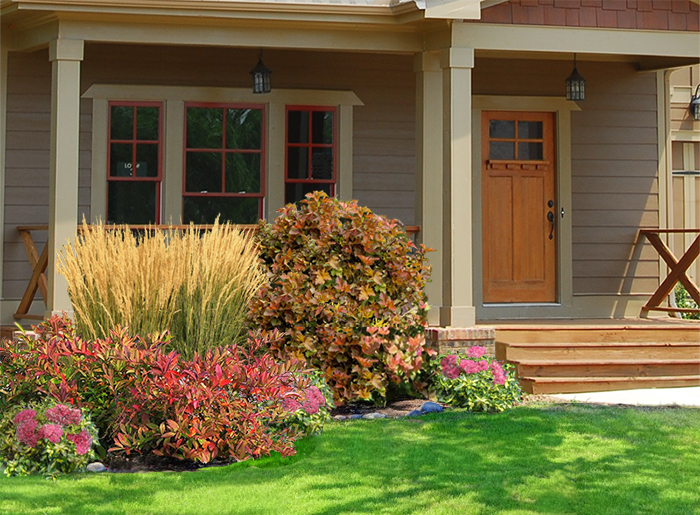 An ornamental grass with green stalks and deep blooms that turn a golden wheat color through the season and into fall. One of the most popular and relied upon grasses for the garden, ‘Karl Foerster’ is an award winner! Extremely strong and vertical. Mature Size: 4-6 ft. with a width of 2 ft. Mature Size: 3-4 ft. with a width of 2 ft.
‘Ruby Ribbons’ has green-blue foliage with red tones creating dimension and interest. Late in the summer, ‘Ruby’ begins turning red and by fall the “ribbons” are putting on a show! Mature Size: 4-5 ft. with a width of 2-3 ft.
Sweetspire is another easy and adaptable landscape shrub. The mounding and spreading habit makes it a great counterpart to nearby vertically growing plants. Only 3-4 ft tall and spreading horizontally to 4-6 ft. means it can live in front of taller plants. Dark green leaves come out in spring and white flowers seem to drip from the branches in early summer. As the season goes on, the foliage starts to change and you’ll see a beautiful combination of deep red, orange, and purple well into fall. The flowers are fragrant, hence the name Sweetspire. Mature Size: 3-4 ft. with a width 4-6 ft.
Light Exposure: Full Sun to Full Shade. Flowers best in sun. The Autumn sedums are a great choice for any full sun spot. Sedums such as ‘Autumn Charm’ or ‘Autumn Fire’ have so much going for them. ‘Autumn Charm’ has yellow and green variegated leaves and blooms an outstanding pink moving to red in fall. ‘Autumn Fire’ lacks the variegation and blooms turn to coppery red in fall. Mature Size: ‘Autumn Fire’, 2 ft. tall with a width of 18 in.